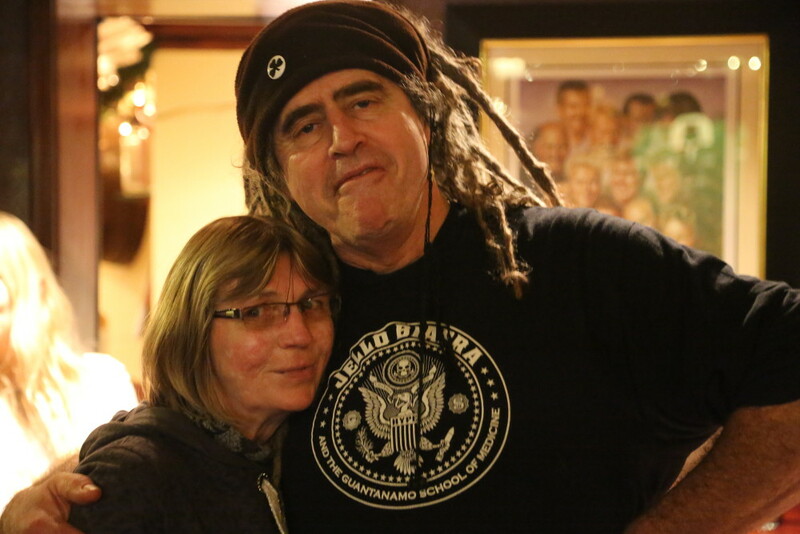 The last few days in Dublin unfolded in a warm embrace of solidarity for imprisoned Pvt. Manning’s mother Susan, aunts Mary & Sharon & uncle Kevin. The family had travelled from their hometown Haverfordwest, south Wales to Dublin, the birthplace of their father. I had travelled by train from London with Carmen Trotta, an old friend from the New York Catholic Worker. We were joined on the ferry by Genny from Wrexham who was to look after the family during their stay in Dublin. Many old friends – activists, organisers, musicians, decent people with a sense of solidarity – who had accompanied us through the 3 trials of the Pitstop Ploughshares (2003-06) came out to support the family of Pvt. Manning. Manning had transited through Shannon on the way to the war on Iraq, his torture in Kuwait & Quantico & now 35 years imprisonment in Ft. Leavenworth for courageously exposing that war. Today, other friends Margaritta and Nial are in an Ennis Court, County Clare for continued nonviolent resistance at Shannon Warport. Legendary James Joyce scholar, Senator and human rights advocate David Norris welcomed the family through the gates of the Dáil in the company of independent TD Catherine Murphy. Other TDs gathered to hear from the family in a conference room in the Dáil. 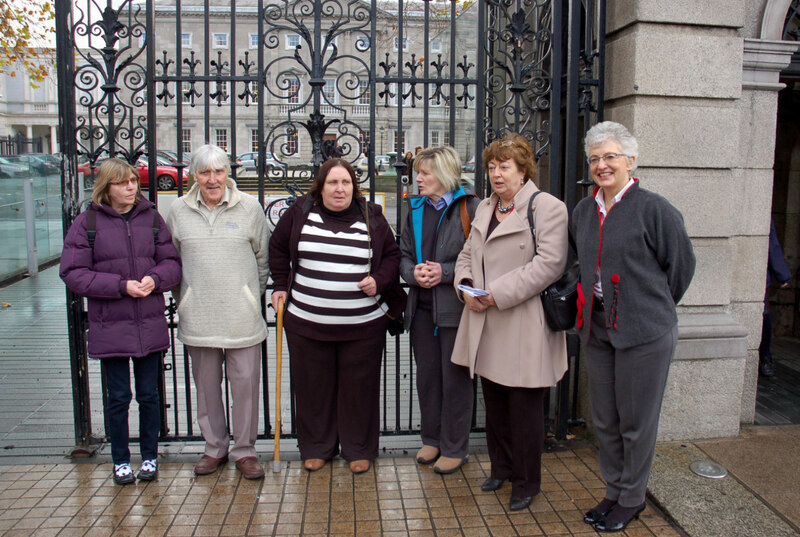 The national broadcaster RTÉ shot footage at the gates of the Dáil which was televised later that evening. The mainstream media coverage of the visit was quite good. The family went to meet with Amnesty International, while Carmen & I went to help Dublin punk artist Seamus Nolan set up his Temple Bar studio for a fund raiser for the family. A good gathering of Dublin punks kicked off a series of solidarity events. 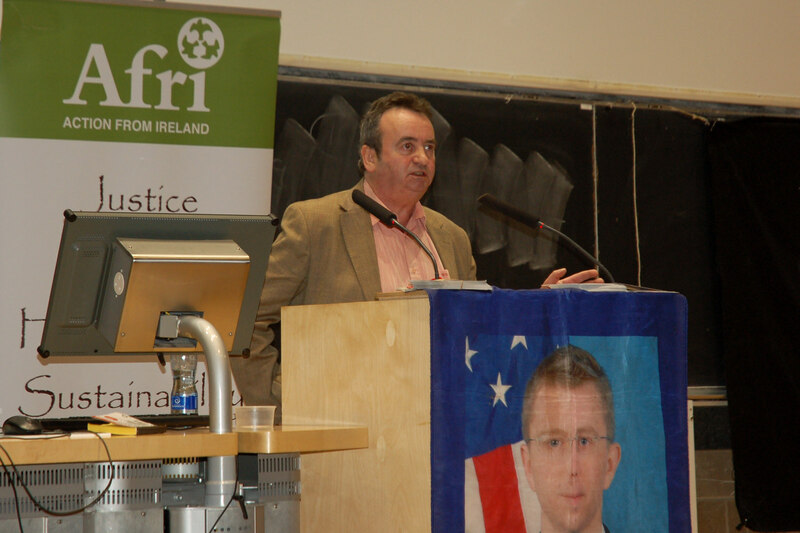 On Friday night, over 100 people gathered at Trinity College to hear a powerful presentation by Gerry Conlon who had served 16 years in British prisons tortured & framed as part of the Guildford 4, his father Giuseppe also framed, died in a British prison. The following day was the anniversary of Gerry’s kidnapping by British forces in his hometown of Belfast. Gerry reminded us that it is not only the prisoner who faces the consequences of imprisonment but also the families. He told us that prison does not end on the day of your release, how the consequences for the Guildford 4, Maguire 7, Birmingham 6 and others continued for decades. Gerry said how much they needed Mannings, Assanges and Snowdens back in the north of Ireland when dirty wars were being waged and innocent people were being fitted up and killed. And how much we need whistleblowers today and that we need to be supporting them when they have the courage to tell us the truth. Carmen Trotta of the New York Catholic Worker reflected on where 12 years of the “War on Terror” has brought us and the significance of the courage & actions of Pvt. Manning. It was also powerful to be present as Joe Black played his song “Giuseppe Conlon” for Mum Susan, aunts Mary & Sharon & uncle Kevin. Guildford 4, Guantánamo detainees and Julian Assange lawyer Gareth Peirce joined us as an apparition from London having recorded a speech that afternoon. On Saturday afternoon, Máirtín and Andrea put on lunch for Pvt. Manning’s family, folks from the Catholic Worker network in Ireland and other friends. Saturday night was a great knees up in the Brian Boru pub on the way to Clontarf with Joe Black on guitar and Robbie Sinnott on accordion leading the line. Gallery | This entry was posted in Reports and tagged Bradley Manning, Chelsea Manning, Dublin, Gareth Peirce, Gerry Conlon, solidarity. Bookmark the permalink.